A Mail Transport Agent (MTA) is essential for sending email. A Mail User Agent (MUA) such as Evolution, Thunderbird, and Mutt, is used to read and compose email. When a user sends an email from an MUA, the message is handed off to the MTA, which sends the message through a series of MTAs until it reaches its destination. Even if a user does not plan to send email from the system, some automated tasks or system programs might use the /bin/mail command to send email containing log messages to the root user of the local system. Red Hat Enterprise Linux 5 provides three MTAs: Sendmail, Postfix, and Exim. If all three are installed, sendmail is the default MTA. The Mail Transport Agent Switcher allows for the selection of either sendmail, postfix, or exim as the default MTA for the system. 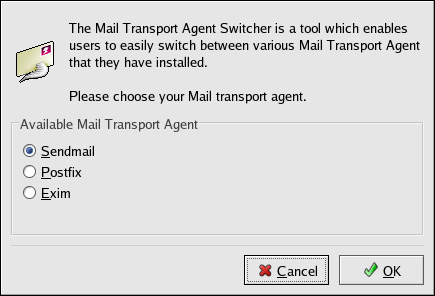 The system-switch-mail RPM package must be installed to use the text-based version of the Mail Transport Agent Switcher program. If you want to use the graphical version, the system-switch-mail-gnome package must also be installed. To start the Mail Transport Agent Switcher, select System (the main menu on the panel) => Administration => Mail Transport Agent Switcher, or type the command system-switch-mail at a shell prompt (for example, in an XTerm or GNOME terminal). The program automatically detects if the X Window System is running. If it is running, the program starts in graphical mode as shown in Figure 23.1, “Mail Transport Agent Switcher”. If X is not detected, it starts in text-mode. To force Mail Transport Agent Switcher to run in text-mode, use the command system-switch-mail-nox. If you select OK to change the MTA, the selected mail daemon is enabled to start at boot time, and the unselected mail daemons are disabled so that they do not start at boot time. The selected mail daemon is started, and any other mail daemon is stopped; thus making the changes take place immediately.